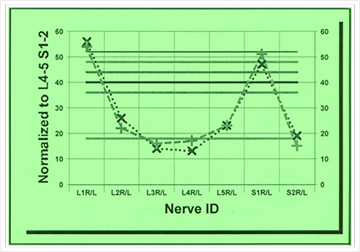 A-DELTA fast pain fibers testing is a non-invasive, painless, quick, easy to perform Neural Scan which can diagnose nerve root involvement with 95% sensitivity. What Are A-DELTA and C fibers? These are small nerves which exclusively localize and transmit pain signals to the brain. A-delta fibers are fast nerves which localize the pain with accuracy, while C fibers are slower nerves and poorly localize the pain. Due to the location of these fibers in the nerve bundles, they are prone to injury. Most of the pain originating from the cervical and lumbar spine affect, these nerves earlier than the larger motor nerves (which control muscle function). With A-delta fiber damage, the nerve becomes numb and is unable to localize pain accurately. Which Patient Should Be Tested? Any patient with significant neck, back, upper and lower extremity pain with no significant associated weakness, which have not responded to conservative therapy. Why Test for A-delta and C Pain Fibers? Pain cannot be imaged MRI, Cat Scan and X-rays only reveal anatomical abnormalities, not abnormal nerve function. Frequently physical examination is not specific and sensitive enough to diagnose nerve pathology accurately. EMG/NCV only determines muscle damage and advance sensory nerve damage, not pain nerves. Pain fiber testing is 95% sensitive, painless, quick and cost effective Most importantly, through accurate diagnosis, your physician is able to provide more efficient and successful therapeutic interventions. A-delta fiber testing is performed in the office and usually takes 20 minutes. The procedure is painless and does not require any special instructions before or after. A-delta fiber testing is covered by Medicare and most insurance companies. Results are available almost immediately. Your physician will discuss the results the same day or on a follow up visit.